At an unprecedented pace, cloud computing has simultaneously transformed business and government, and created new security challenges. The development of the cloud service model delivers business-supporting technology more efficiently than ever before. The shift from server to service-based thinking is transforming the way technology departments think about, design, and deliver computing technology and applications. Yet these advances have created new security vulnerabilities as well as amplify existing vulnerabilities, including security issues whose full impact are finally being understood. Among the most significant security risks associated with cloud computing is the tendency to bypass information technology (IT) departments and information officers. Although shifting to cloud technologies exclusively may provide cost and efficiency gains, doing so requires that business-level security policies, processes, and best practices are taken into account. In the absence of these standards, businesses are vulnerable to security breaches that can erase any gains made by the switch to cloud technology. 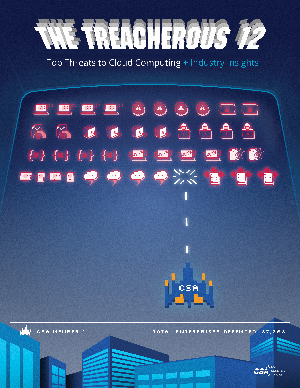 Similar to the earlier mentioned research artifacts, the “The Treacherous 12 - Cloud Computing Top Threats in 2016” play a crucial role in the CSA research ecosystem. The purpose of the report is to provide organizations with an up-to-date, expert-informed understanding of cloud security concerns in order to make educated risk management decisions regarding cloud adoption strategies. The report reflects the current consensus among security experts in CSA community about the most significant security issues in the cloud.